Babylon 5 was a groundbreaking TV series, and one that in its own way has helped reshape the face of SF TV. B5 was the brainchild of J Michael Stracynski (JMS), and unlike the standard fare on offer at the time, it was designed to have a definitive five year arc. That is, it would have a beginning and an end linked by a progressive storyline. What made this different from most US shows was that, while they would normally have a beginning, once the initial introduction was made each episode would be self contained and only rarely would the effects of one story have an impact in later episodes. It’s true that some would have an ending, but mostly this would be one or a handful of episodes that either resolved the issue behind the initial principles of the show, or just created an ending. Of course many shows just disappeared; cancelled at the whim of the ‘suits’ and left viewers to wonder what happened next. JMS was determined that his story would be told, and that the story would take its five years. Another revolutionary factor in B5 was that the special effects would be created not with models as on other shows, but by computer modelling (CGI), a technique that was in its infancy and rather than save money usually resulted in large bills and costly hardware. Thankfully this was the era of the Commodore-Amiga home computer. The Amiga had been blessed with a very flexible OS and expansion slots (it was a multitasking PC with an auto-detecting expansion slot long before Windows discovered “plug’n’play”). 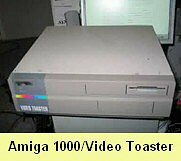 What really made the Amiga attractive though was a piece of hardware called ‘The Video Toaster’, which enabled an Amiga to function as the heart of a small TV production studio, something that many of the independent production companies and public access TV stations made use of. Part of the Video Toaster system was a revolutionary 3D modelling and animation package called ‘Lightwave 3D’. It was with Lightwave and Toaster equipped Amigas that the initial B5 effects would be created on; though I must, painful though it is, admit that production later moved to high-end Windows systems (Lightwave having become multiplatform). So with a relatively cheap CGI system it soon became obvious that the ability to create new space craft, aliens and effects on the fly was a lot more time and cost effective than having to physically build each new model and then film it. The B5 pilot was a success and Warner Brothers gave the go ahead for a series proper. There were a few changes between the pilot and the series, in make up, effects and casting, but the series had arrived. B5 would eventually complete its five year mission, though not without problems and now it is not uncommon for new SF TV shows two emerge with both an ongoing arc and CGI effects; not that they all manage to reach the end of their story – vis-à-vis Crusade. In addition to the pilot and five seasons, Babylon 5 also spawned four TV movies, two of which were intended as pilots for new shows, though only the ill-fated Crusade managed to become a reality, comic books, RPGs, novels and almost a computer game. Recently there has been much talk of a full motion picture ‘The Memory of Shadows’ but regrettable this has now been announced as cancelled. Still it would be foolish to discount the possibility of further developments in the future. Man is a young race just venturing into space using technology bought from the Centauri. Travel between star systems is via hyperspace which is accessed either by jumpgates which open up a portal between real space and hyperspace. Once in hyperspace ships navigate between jumpgates by following beacons; stray of the beacon and you could be lost forever. Larger ships however may contain jump engines and therefore be able to form their own jump points, though they are still dependent upon the hyperspace beacons to navigate safely. Babylon 5 is orbiting a dead world in a part of space that forms a crossroads between the major systems and has its own jumpgate. Because of its position Babylon 5 is the ideal place for negotiations and business deals; it also acts as a stopover point for Interstellar transports and passenger services. The government of Earth (called Earthdome) is under the control of a democratically elected president (Santiago at the start of season 1), and controls a number of colony worlds including Mars (though the Mars colonists aren’t all happy about this). While Earth has only recently been active in deep space (and lacks such basic technologies as gravity control-parts of Earthforce ships and the whole of Babylon 5 have to spin to create gravity) they have been involved in two major conflicts (against the Dilgar and the Minbari) and have proved themselves once of the major powers. Telepaths are a known evolutionary branch in several of the races, particularly the Centauri, Minbari and Humanity, though the Narn have no telepath gene. On Earth telepaths are controlled by the Psi Corps and it is compulsory for all telepaths (called teeps) and telekinetics (called teeks and a stable telekinetic is an extremely rare find) to join the corps. Those that refuse to join are forced to take drugs to suppress their abilities. The most powerful of telepaths join the Psi Cops who are responsible for policing telepaths and enforcing Psi Corps regulations. As Earth feels it is at a technological disadvantage amongst the other races it is constantly seeking new technologies and other valuable commodities. Leading this is InterPlanetary Expeditions (IPX) which has powerful links within Earthdome, and effectively controls most facets of exploration and discovery. Sinclair’s long time friend Caroline Sykes/Catherine Sakai (a change of actress, name and ethnicity between the pilot and season 1) sometimes works under contract to IPX. Earth is also the home of the respected Interstellar News (ISN), broadcasting from its main facility in Geneva. ISN is the voice of the galaxy offering impartial news and comment throughout human, and neighbouring, space. As Babylon 5 and Crusade are now available on DVD, I think it only fair to warn that some plot details will be revealed in the following sections.